The writer further elaborated: “we had a wealth of background about the Predator that, for one reason or another, we weren’t able to get into the first film. With the sequel, we’ve been able to tell all the backstory and basically catch up. For instance, we discover that the Predators are a race of hunters and sportsmen who’ve been visiting this planet for 700 years. We’re able to show his spacecraft for the first time and basically get down to the mechanics of what he does. We explain to the audience in no uncertain terms tha the creature is not a psychopatic monster and that its motives and agenda are pure.” The film thus acts as a “bible” from which any sequels would be based upon. Stan Winston’s effects company was brought in again to give life to the new Predator. Unlike the hectic conditions the effects artists were forced to work within for the first film, this time they were allowed to work within a normal schedule. Much like the story, they were also able to reuse ideas that could not be realized for the first film. 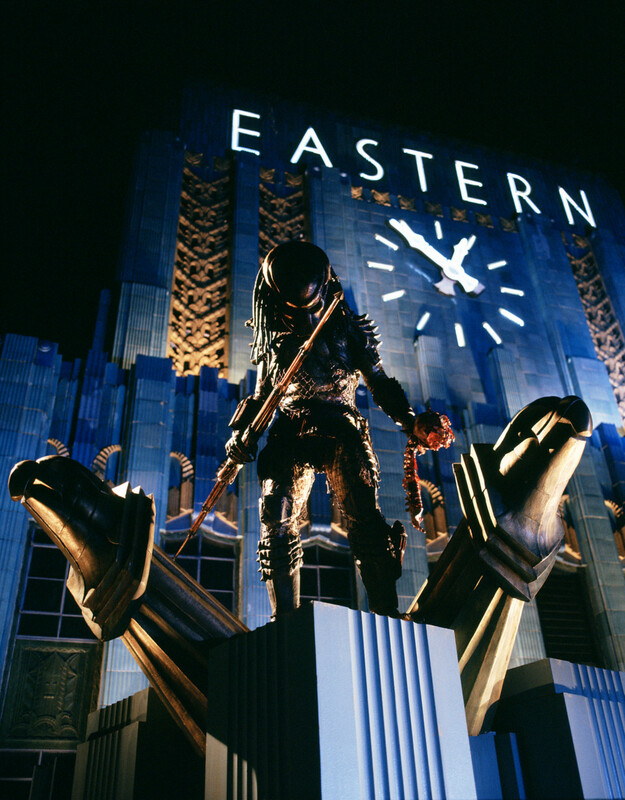 Predator 2 also marks the first film design work of famed concept artist Mark ‘Crash’ McCreery — who redefined the look of the Predator for the new story. 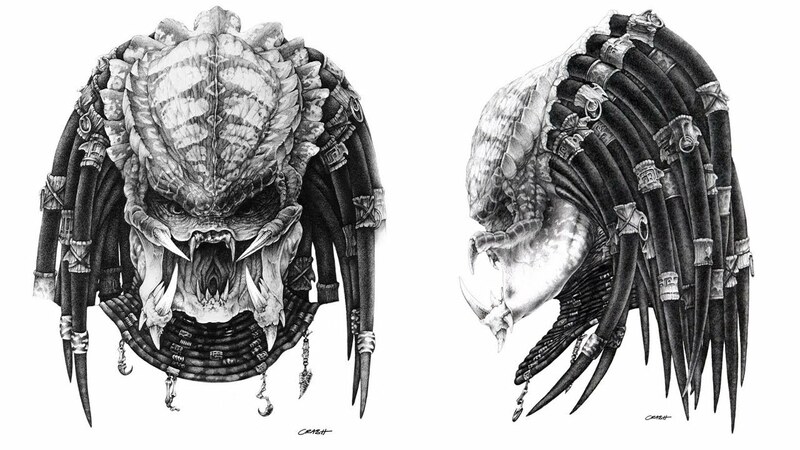 The Predator’s head was refurbished with “a horned brow ridge,” as well as other cosmetic additions: thorn-like protrusions were added to its mandibles, the lower ones of which feature evident gums — as opposed to the first Predator’s, which just blended with its outer skin layer. “We’ve strengthened up his mandibles a bit and given his tusks more character,” said Winston. More tribal ornamentation was added to the overall aesthetic of the creature. 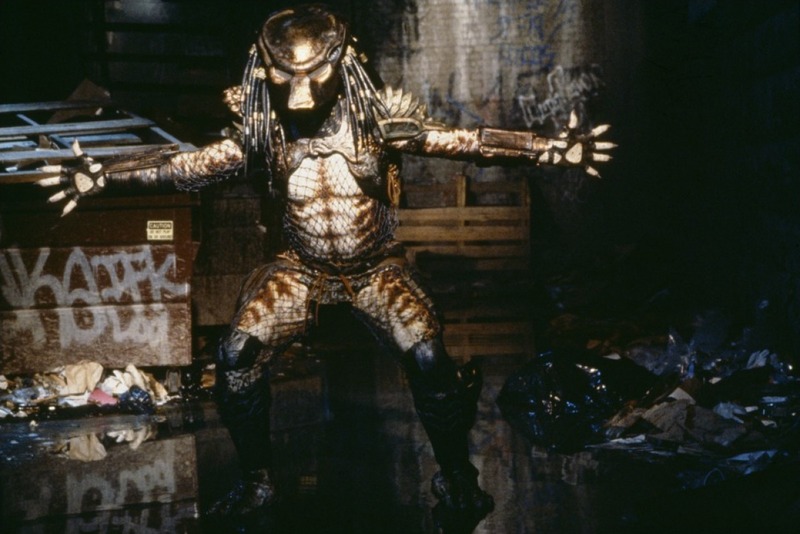 The sculpture of the Predator’s body incorporated only basic armour pieces. This enabled the artists to dress moulds of it with different additional armour pieces and weapons at will. The hunter was given a forked tongue, a concept originally devised for the first Predator but unrealized for reasons of time and budget. 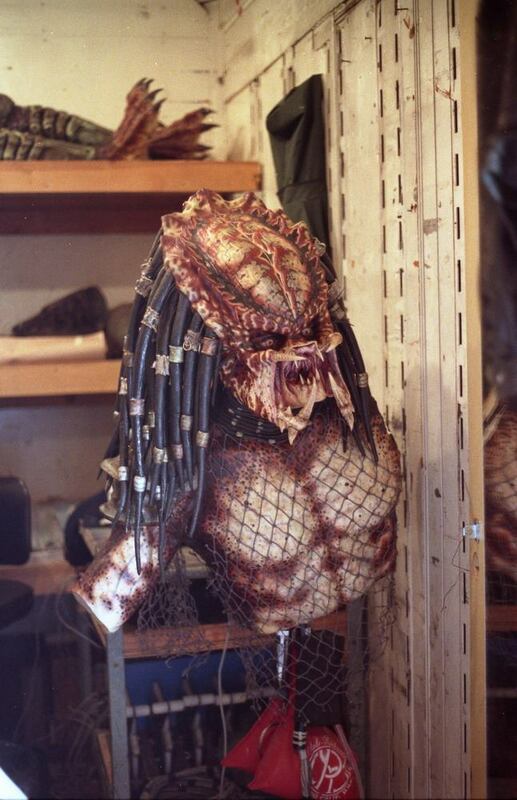 The special effects team built two suits, a stunt head, and a hero head — as well as an insert puppethead and torso of the creature, used for extreme close-ups of the Predator’s face. A puppet head allowed more space for internal mechanisms animating the face, thus increasing the detail of motion — such as when the Predator ‘talks’. Various insert creature portions were built. 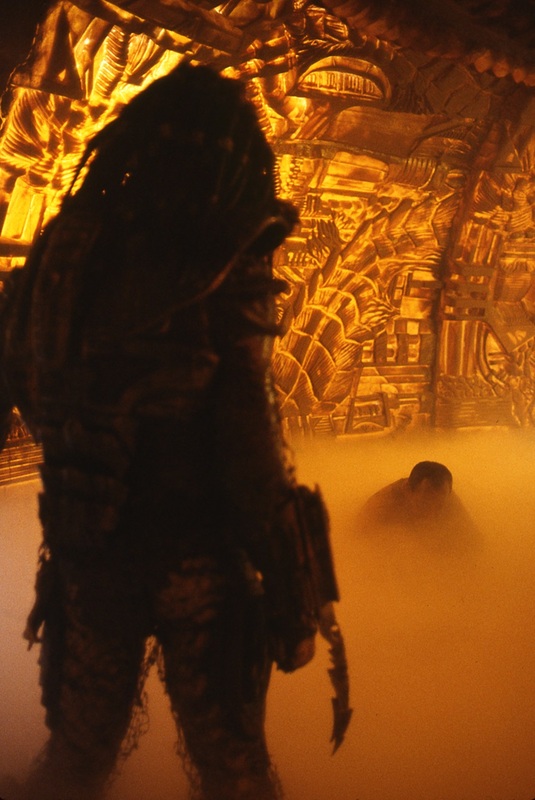 Insert Predator legs that produced sparks were used for close-ups of the falling Predator during the final fight. 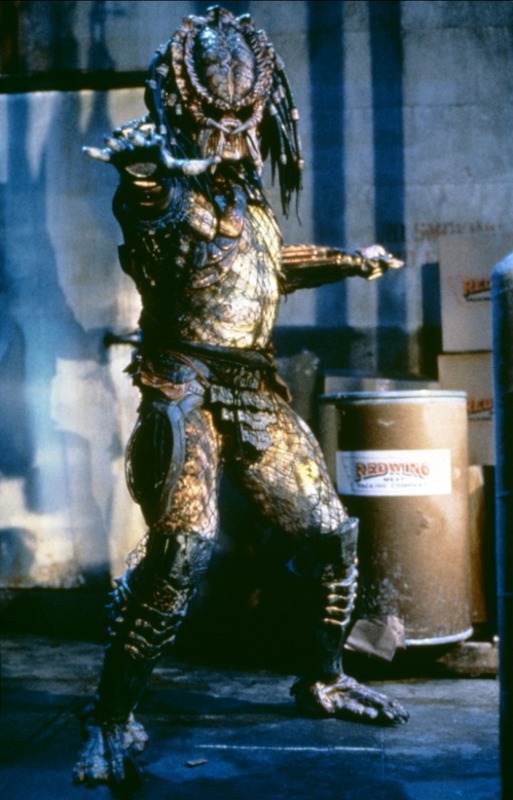 Portrayal of the left arm-less Predator was achieved with a detachable arm mounted on a suit devised for stuntman David Smith, who portrayed the Predator in most scenes of the film’s finale. The new mask was refined from a discarded concept design for the original film — a more angular design combined with a bronze-based colour scheme. A stunt foam latex helmet and hero fiberglass helmet were built. The new armour featured more ridged patterns, and generally remained consistent with the color scheme of the mask. Much like the forked tongue, several weapon ideas proposed for the first film — but eventually discarded — were recycled for the new project. 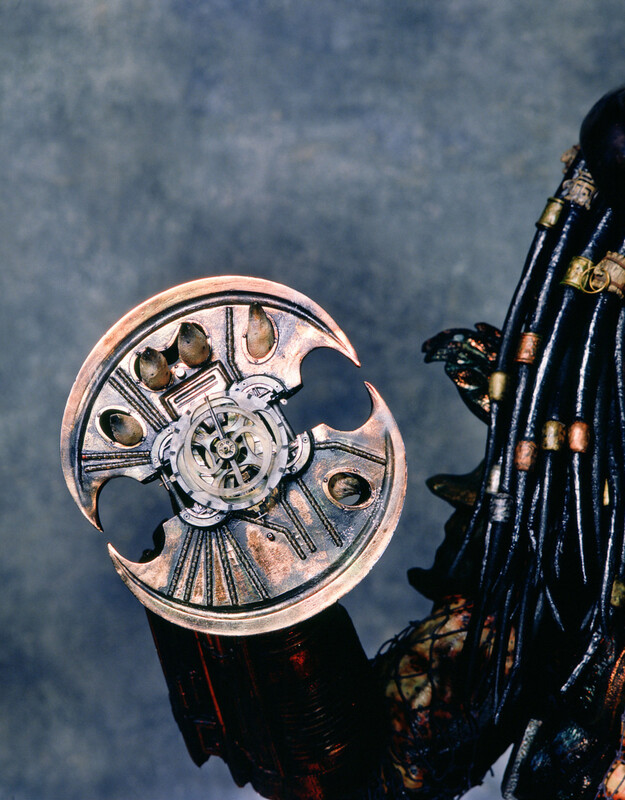 Accompanying the wristblades and shoulder cannon — which was refurbished with a more streamlined appearance and a ridged design — a whole new set of weapons aided the Predator in Predator 2. the hunter’s spear was built in four versions: hero, stunt, and two telescoping spears — one that compressed halfway through and one that reprised said motion, compressing from halfway through to fully compressed. The smart disc and the net launcher could attach to different parts of the Predator’s armour, located, respectively, in the right thigh and right calf. The spear-gun, another recycled idea, was housed in the left gauntlet. 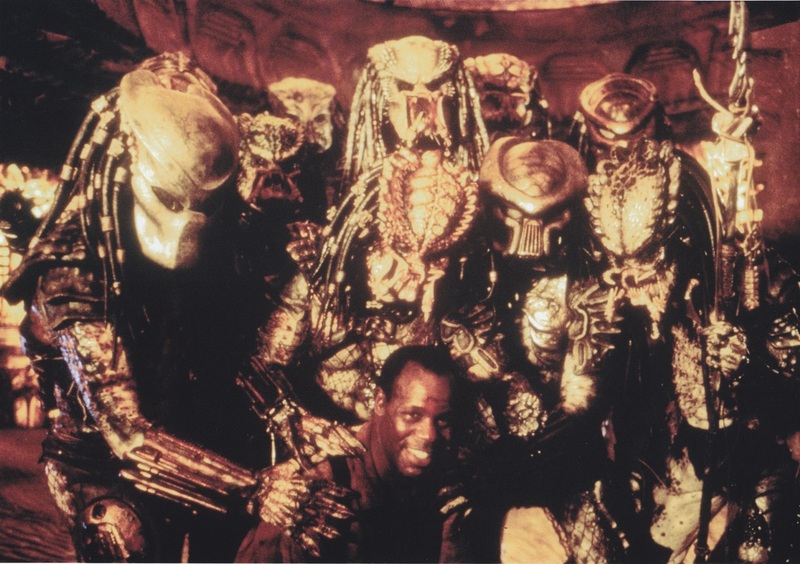 In the original scripted climax of Predator, Dutch was to enter the creature’s ship — and witness a wall of hunting trophies. 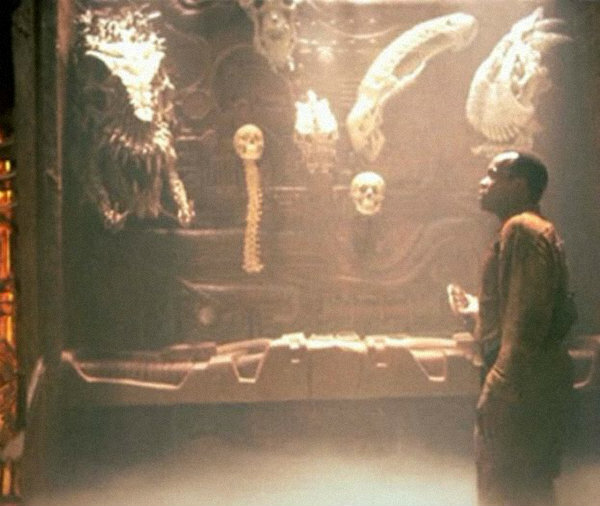 This was another reused concept for the sequel, where Harrigan takes a moment to witness a wall adorned with skulls from the various intergalactic hunts of the Predator’s tribe. Each and every skull was assigned to a single Winston Studio artist — including Steven Fuller and Len Furge — to sculpt, based on concept art by Bruce Spaulding Fuller. Featured as an in-joke and homage was also a skull of one of the creatures from Aliens, sculpted by Kevin Hudson. The skulls were crafted in polyfoam and hardened with a resin coating. 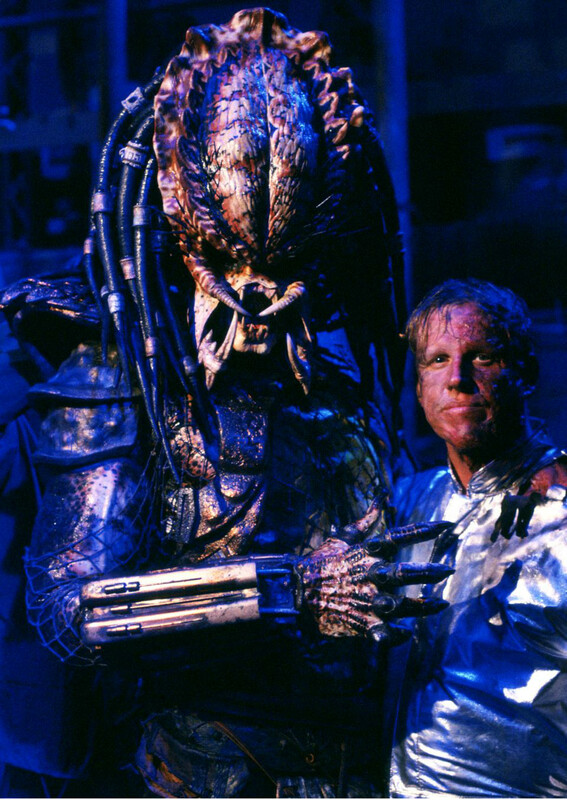 After the final duel taking place in the creature’s spaceship — with Harrigan seemingly killing his opponent — the entire Predator tribe is revealed. 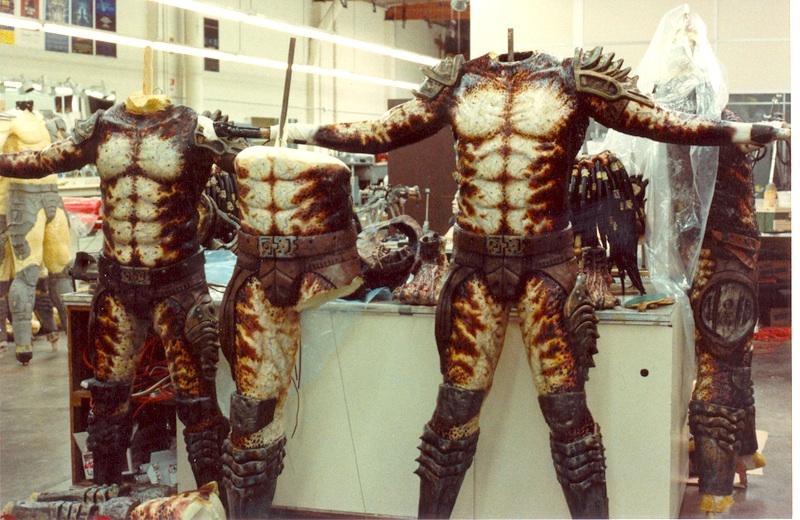 For this sequence — the most expensive in the entire film — Stan Winston Studio built nine additional Predator suits; single artists worked on each suit, endowing them with their personal artistic touches and signature traits. 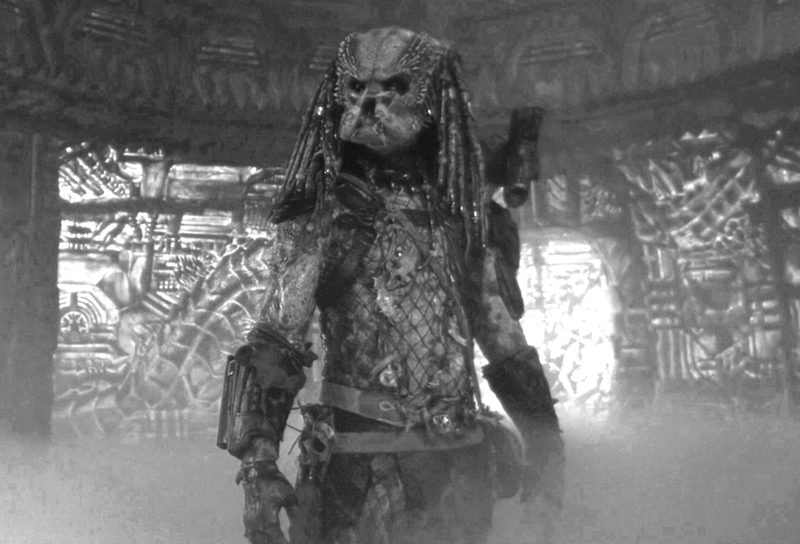 Each Predator was distinguished by its texture, colour scheme, armour style and texture, and mask (or lack thereof). 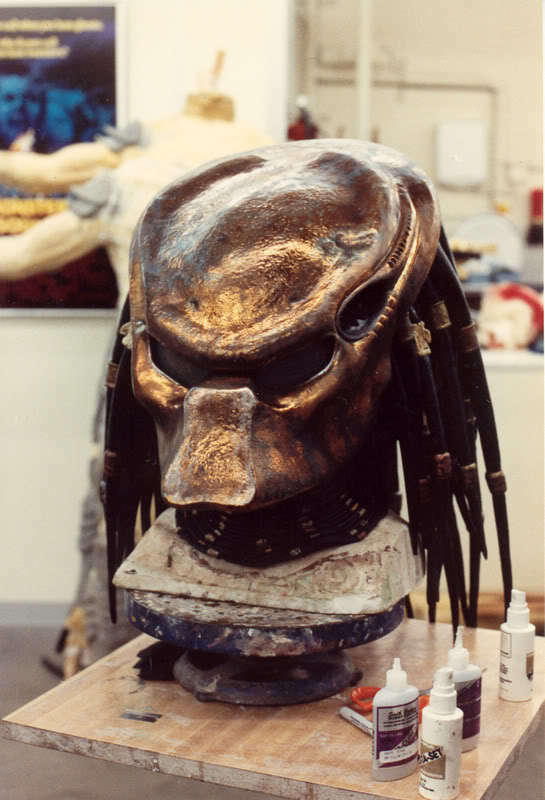 The basic sculpture of the Predator enabled it to be moulded multiple times, and each mould to be ‘customized’ in different ways. As such, a wide array of creative liberties and arrangements was allowed on the crew’s part. Specific head and mask designs were individually sculpted and moulded. The first member of the tribe to appear is the Elder Predator. 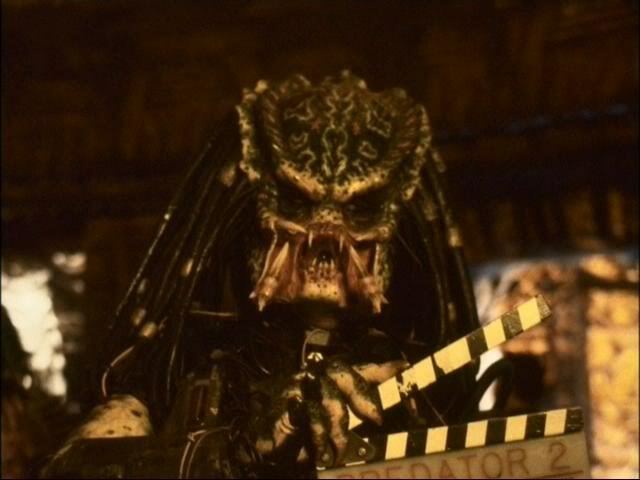 Based on storyboards for the film, it was initially considered to have the Elder kill the main Predator by slashing its throat — presumably for its dishonourable conduct. This scene was changed thereafter, with Harrigan seemingly killing the Predator and the other tribe members carrying it away. 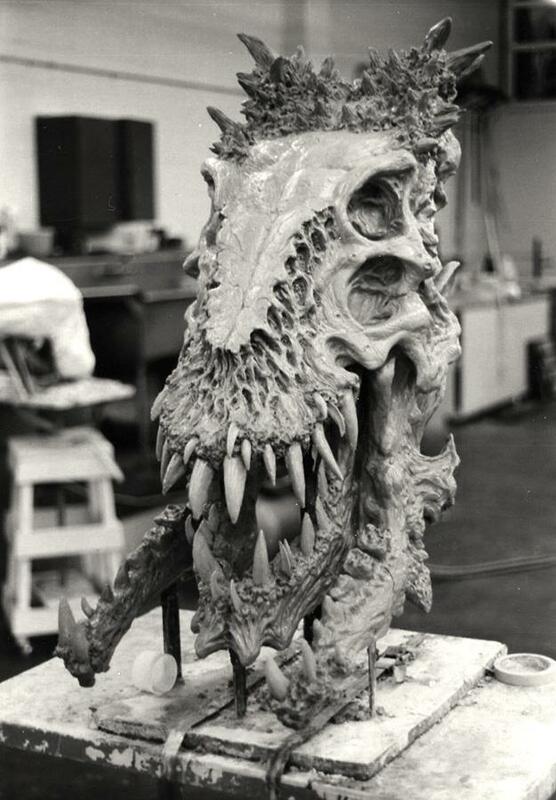 The Elder Predator was actually sculpted with the original creature moulds as a base. Its details and textures were modified to give the character a more worn-out, senior look — additional quills, thorns, and plates. The exposed lower mandible gums of the new design are also present. “We changed the structure and the look of it a bit,” said Shane Mahan, “and broke a tusk on it to make it look older. It was fun to go back and do that guy again.” The creature was given a self-targeting shoulder cannon, and the same small sword that had been created for the first film but left unused. 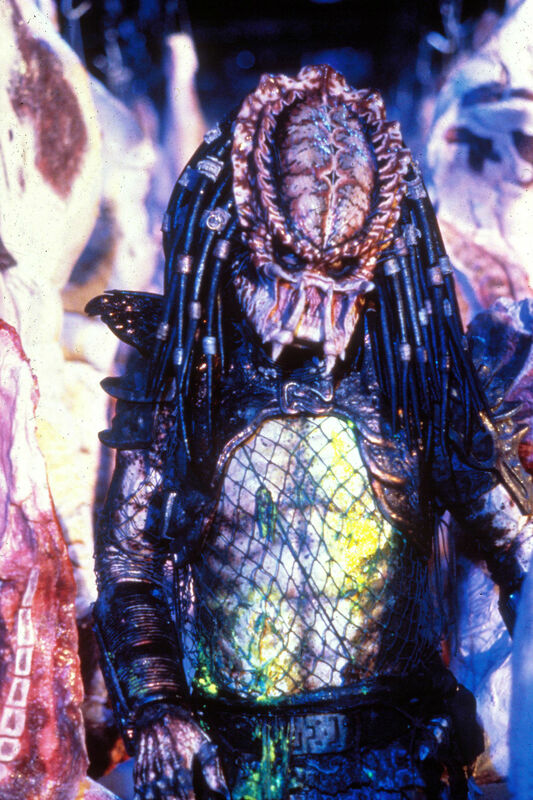 The Elder Predator marks Kevin Peter Hall’s last screen appearance as the Predator, as the actor tragically died in 1991 after a contaminated blood transfusion. Regarding the other tribe members, previously unused mask designs made their way into the screen, including the original mask prop of the hunter of the first film. 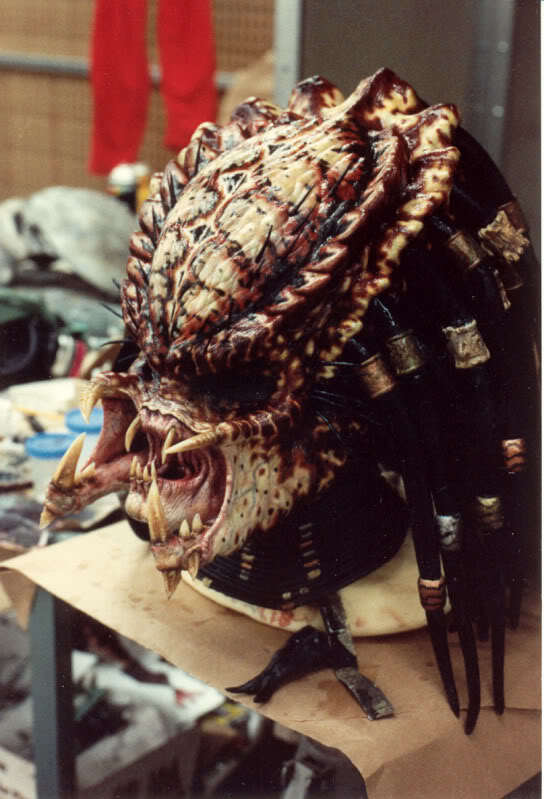 The screen-used final mask of the first Predator was also recycled. Other weapons, masks and faces were sculpted and moulded specifically for the project. The clan was played by a team of basketball players. For more pictures of the Predator and its tribe, visit the Monster Gallery. Posted on 01/03/2018, in Movie Monsters and tagged Crash McCreery, Kevin Peter Hall, Predator, Predator 2, Stan Winston. Bookmark the permalink. 5 Comments. Great stuff. I’ve never got the hate the Predator in the second film seems to get. I think it looked great, the head design in particular was awesome. The be all end all Predator film.It never got better than this.